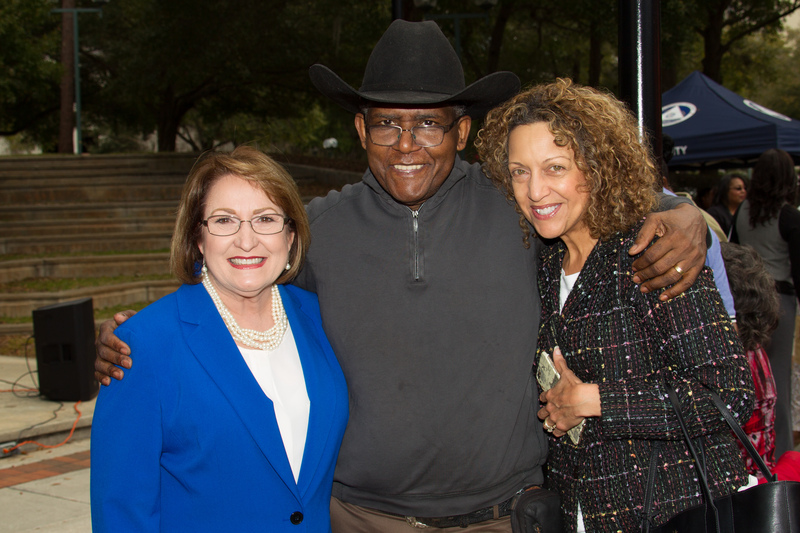 Orange County Mayor Teresa Jacobs joined citizens and employees for Orange County Government’s Annual Black History Month Celebration Luncheon, held on the lawn of the Orange County Government Administration Center in Downtown Orlando. The free event, coordinated by the Black History Committee of Orange County (BHCOC), featured food vendors and live entertainment. Informational booths regarding the services BHCOC offers to local citizens were also included. “Today’s celebration provides an opportunity to reflect on the accomplishments of those individuals who selflessly fought for the equal rights and freedoms of African-American citizens, and as a result, paved the way for future leaders of all backgrounds and cultures to make a positive impact on our nation,” Mayor Jacobs said during her remarks at the luncheon. Orange County and the BHCOC have worked together for many years to develop programs and activities to support the goals and achievements of the nation’s brave and beloved African-American civil rights and community leaders. “I think it is important that our citizens and employees see that as an organization we embrace diversity and value the contributions African Americans have made in our community and in our country,” said Vernard Batson, BHCOC chairman. The Black History Committee of Orange County has continued to pave the way for future generations through their educational and community efforts. Since 2004, the committee has provided more than $300,000 in community donations and scholarships to Bethune-Cookman University, Edward Waters College, Florida A&M, Florida Memorial University, University of Central Florida, Valencia College and Rollins College. Orange County continues to remember the life and legacy of so many Central Florida pioneers, including Zora Neale Hurston, the famed author who adopted Eatonville as her home; Pappy Kennedy, the first African-American elected to the Orlando City Council; Mable Butler, who served as Orange County’s first African-American County Commissioner and who held the first Black History Month Festival in 2006, Judge Emerson R. Thompson, Jr., the first African-American Chief Judge in the 9th Judicial Circuit, and former Chief Judge Belvin Perry, Jr., the first African-American in Central Florida to be elected Judge without first being appointed. To view more photos from the Black History Month Luncheon, visit Mayor Jacobs’ Flickr album.